I LOVED this week's Sketch Saturday sketch! It was completely perfect for a card I had in mind for my little girl. Now I appreciate at 19 months old she won't appreciate the effort that went in to it, but hopefully in about 16 or so years she might do! I've used a Sugar Nellie image, the Lacey Circles Nestabilities die, crochet trim and Prima flowers. I was going to cut her out and stick her on the circle but I would have lost a lot of the detail so I stamped her directly onto the circle which meant only the star on her wand was missing, so I stamped that again onto another piece of card then decoupaged it onto the circle. This cluster of flowers was quite tricky. I firstly stuck on the very large poinsettia (which can barely be seen now!) and the punched snowflakes, and then the Prima flowers but there was too much of a size difference so I took them all off again and added the crocheted flowers, then the Prima flowers, then the crochet bow and finally the pins. I swore quite a lot during this process as they all kept moving and wouldn't stay where I wanted them! I got there eventually though and am really pleased with the result! Finally I had to fit in a sentiment somehow so I printed one on my PC and stuck it to the bottom right corner of the card - it's now on the sketch but my excuse is 'artistic license' and I'm sticking to it! 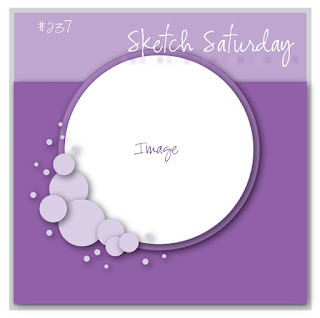 This week's Sketch Saturday sketch is sponsored by Simon Says Stamp and there is a prize on offer so make sure you head on over and join in! I love this Niki! It's gorgeous! And your little girl will love it! It'll be interesting to see how card trends will change over the next 16 years lol!